Dreaming is an interesting phenomenon. It’s apparently our way of coping with the stress of day to day living. Well, I have a theory. If we need to process all that we see in the real world, then surely we need some equivalent for our online selves? A lot of us spend a large chunk of our lives wired in to some social network or another. We’re exposed to a lot of information online, much more than our brains were previously used to; where can we possibly go to escape and work out all that? Well, as you might’ve guessed, I wouldn’t be putting forward this theory unless I had an answer. And my answer is BUCKiTDREAM, a new app available now for iOS and Google Play. We reviewed BUCKiTDREAM before a few months, and were mightily impressed by its whimsical atmosphere and easy-to-navigate interface. 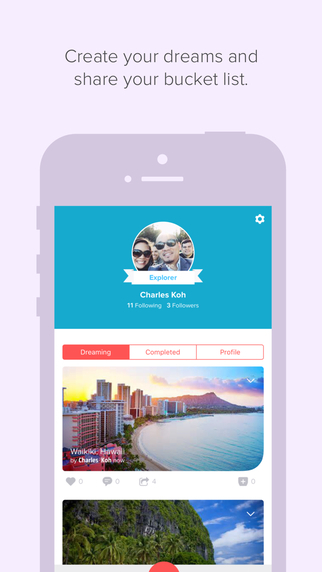 It’s a social network designed for dreamers. You have a network of friends and acquaintances; you can see their posts and they can see yours, the timeline layout is very similar to something like Instagram. And when I say posts, I mean dreams. The idea is that you write out certain dreams you’d like to achieve in your life, and check them off as you complete them. They can be short-term or very long-term; it doesn’t matter, the point is to get them down, make them more real in your mind and hopefully inspire others to do the same. It’s a lovely idea, and one that people have obviously taken to; just a couple of days ago, the app was featured on none other than the Ellen Show, where they helped Ellen realise one mega-fan’s dream of competing at and winning a game on the show. This is a great boost to the app, and shows its universal appeal; everyone has dreams, right? Everyone hopes for things for the future. In the sense of being communal, the developers at BUCKiTDREAM have it exactly right; the app helps bring people together. It really is as uncynical as that. Of course, the developers haven’t just been courting celebrity fans (fans which also include Mr. Richard Branson; BUCKiTDREAM ran a competition recently on his Necker Island). They’ve also put a ton of work into perfecting their creation, which includes adding new features like the ability to add moments to your dreams, and a way of deciding who does and doesn’t have access to them. The interface runs silky smooth, and the app is even more intuitive now, while retaining the same bright colour scheme and sun-bleached vibe. If all this sounds appealing to you, waste no time in getting off the rant-happy Facebook and the self-obsessed Instagram, and get on to the ever-endearing, soul-warming BUCKiTDREAM. Float away to the App Store or Google Play and get dreaming for free today!